It was a relaxing weekend at the beach … until the baggage got unpacked. Meet the LeVays, a well-to-do family vacationing at their Martha’s Vineyard home. When the two adult sons independently choose to introduce their girlfriends to the parents on the same weekend, sibling rivalries flare, opinions clash, class distinctions divide and family secrets unravel. Get your tickets now to Stick Fly, a wickedly funny, endlessly surprising new play by Lydia R. Diamond, directed by Kenny Leon. May be inappropriate for 12 and under. 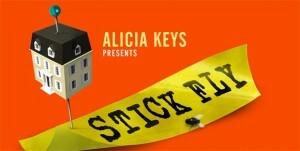 The creative team includes music by Alicia Keys, written by Lydia Diamond and directed by Kenny Leon.